With Playworks’ games and strategies, your students will learn to love active play. 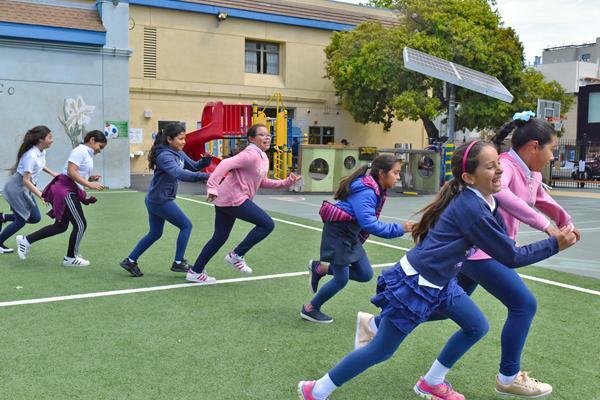 Independent researchers found that students at Playworks schools (especially girls, African American students, and Hispanic students) had 43% more vigorous physical activity at recess than their peers. Physical education is not just for PE class. When done right, recess is where kids discover the life-long joy of being active. Playworks helps you give all kids that opportunity. ✔ Teach kids to resolve their own conflicts so they spend more time playing and less time fighting. ✔ Expect inclusion in games like foursquare and jump-rope so that all kids feel comfortable playing actively. ✔ Introduce game rules that keep kids playing longer, like making everyone “it” in tag.